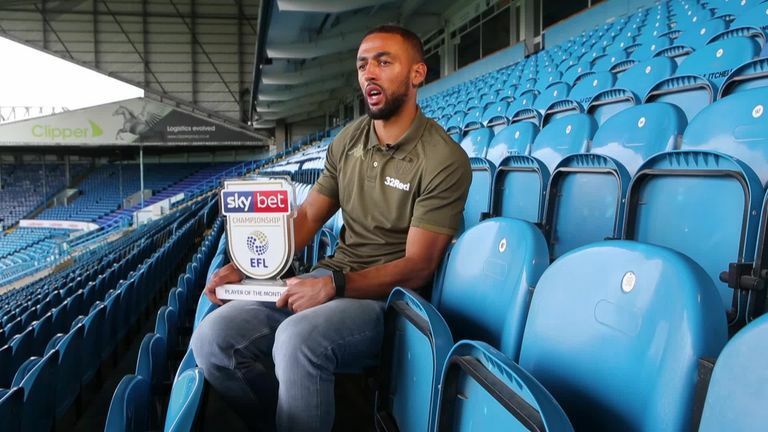 Leeds United striker Kemar Roofe has been named the Sky Bet Championship Player of the Month for August. Roofe has spent his career to date flitting between midfield and attack, but showed his future is as a striker, performing impressively as a frontman. Technically sound in the air and on the ground, he managed four goals and two assists. Roofe said: "It has all stemmed from our pre-season. It has been the best pre-season I have had so far - the hardest - and the style of play that Marcelo is giving us and educating us with is obviously showing. The style of play with the ball, without the ball, our fitness and off the pitch as well, every day he's educating us on how to be better people as well. "I feel like I can express myself a bit more. I am playing in a position where I can show what I can actually do and also the team plays to my strengths as well and also to everyone else's strengths. We are not doing something we're not capable of doing." Leeds United manager Marcelo Bielsa has been named the Sky Bet Championship Manager of the Month for August. The Argentine has made an exceptional start at Elland Road, with six unbeaten games yielded 14 points and took them top. Goodman said: "What an impact Bielsa has made at Leeds United. After last year's great start under Thomas Christiansen, the fans won't yet be getting carried away, but there is the sense that this team is different. "The style of play which Bielsa was known for in Spain and led him being touted to some of the biggest clubs in Europe is already in evidence at Elland Road and the players are responding to his methods." Evans stated publicly that the Peterborough job was the one he had been waiting for and the feeling is mutual after a perfect August saw his side collect 15 points, score 15 goals and sweep the opposition away with their attacking prowess. Evans said: "The boys have worked incredibly hard, as everyone knows in football it is a new group. They have been terrific, they have gone about their business properly, and they have been backed with some terrific staff, hence why this award is in recognition to the staff and all the players, because they have been nothing short of outstanding. "What we are trying to do now is just have a consistent approach, a real focus to work hard every day, and being able to get back on the bike when we fall off and we will fall off, but we have to make sure we fall off less than the others." What an impact Cummings has made at London Road. Six goals and three assists as he helped propel Posh to the top of Sky Bet League One. Commanding in the air, skilful on the floor, the on-loan Scot has formed an instant partnership with Matt Godden. Cummings said: "Any of the boys could have won this, so I will dedicate this to the boys as well. We have been unbelievable so far, and it is early doors so we don't want to get too carried away, but hopefully it continues. It is the best start I have had so far and I am just enjoying my football at the moment. "I am playing in my favourite formation, my favourite position, which is two up front and it is just like playing with your best mates. The boys are all down to earth, they are good lads and got good banter. We have just started so well and I hope it continues. "For a striker I am getting chances every game. Fair play to all the boys who have been different class, I couldn't have won this without them. They set it up for me, they've won me a few penalties, and made my life easy. I just tap it in at the end of the day and get all the headlines!" Cowley picked up where his team left off last season, allying fitness to an unquenchable team spirit that brought his side 13 points from five unbeaten games. Cowley said: "It is a new group and we are learning about each other every day, so we are certainly a work in progress. But we have been pleased to accumulate the points that we have done in what was a really, really tough start to the season in terms of the fixtures. "It has been a good start, but it is only a start. It certainly gives us a platform to push on from, but the Manager of the Month award is firstly a team effort, but also a club effort, and I just want to congratulate everybody behind the scenes for all of their selfless hard work. "We are pleased to get the Manager of the Month award, but we will be even happier if we can get the April Manager of the Month award, because that will mean that we are performing at our best in the business end of the season." After seven seasons in non-league, Norwood's return to the EFL could not have gone better with five goals in as many games and all but one of Tranmere's total. He allies a prodigious work-rate and harrying defenders with calmness in front of goal. Norwood said: "It is just credit to the rest of the team - the way we play creates chances for me, and I am lucky enough to be on the end of them and they are lucky enough that they have gone in for me. "I think I have got a point to prove. I believed I could play at a certain level since I was 18, 19. I haven't had the chance, so if I have to build myself up year by year then hopefully I can do that. "I didn't win it [the player of the month award] in the Conference in nine years, so obviously to start the League Two campaign with this award is obviously a credit to the team and good for myself, and hopefully I can win a couple more."